Monday was the last day we mowed fairways at the normal summer cutting height. The growth has slowed with the shorter light period and cooler nights. We raise the height to allow the turf to begin to store energy for winter and to help protect it from the cold temperatures we will experience. We will probably mow the turf at the new height for a couple of more weeks and will then allow it to go into dormancy a little taller. Best year for zoysia that I have seen in a long time. Assistant Mike spent the first two days this week applying our Large Patch on Zoysia treatment. This application is made to all tee, fairway, and green surround areas that contain zoysia to help reduce the negative of effects of this disease next spring which is the time of year that our zoysia is more susceptible to the disease. If we waited to apply the material next spring at a curative rate, the disease would be much more difficult to control and the disease do more damage to our turf. 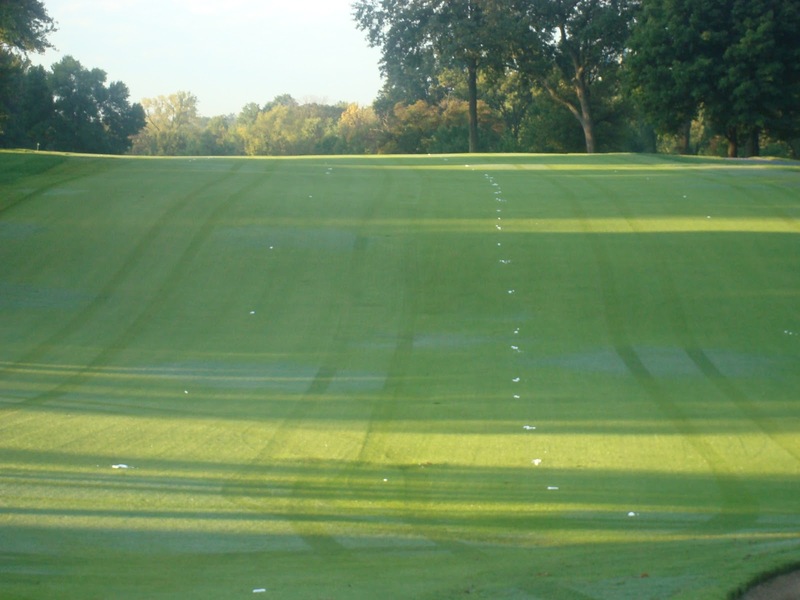 The fall preventative application does not always prevent the disease from occurring but it does slow its overall affect. Here is the link to last fall and spring postings regarding large patch if you are interested in further reading. Its interesting in the activity of the disease from one year to the next. Last year, we had activity as early as August 31st. This season, I've seen just a couple of minor spots on September 25th. You can see the spray tracks in the dew and the marker foam that is used to help the operator keep the spray in proper alignment. been used so it will be ready to use next season as necessary. Let's hope it is not used very frequently. A-4 is a variety of bentgrass that has shown great results so far on greens renovated in our area and across the country. We will also be using sod next season from our collar nursery that is next to the 16th tee to replace some additional poa infested collars. in a heal. The sand will help provide protection for the plants as they fill in place and will improve ball roll. 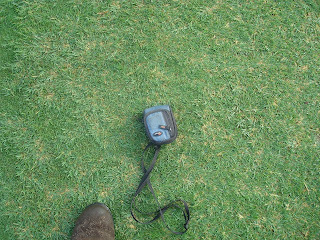 We continue to reduce our height weekly and have been dragging in our sand which stands up the turf. 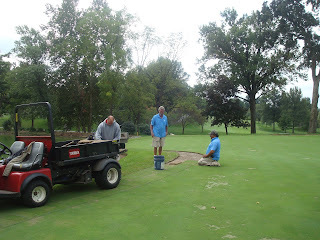 Assistant Skip, Nick and Jason working on #9 collar last week. Jason and Tom working on #6 green. Jason and Tom finishing the last couple pieces of sod on #6 green. A damaged spot on #9 green that has new bentgrass growing. Here is a close up of the same spot. We have about 20k square feet of cool season tees on property with about 1/4 of the surfaces being bentgrass/poa and the other parts a mixture of poa/bluegrass/ryegrass. 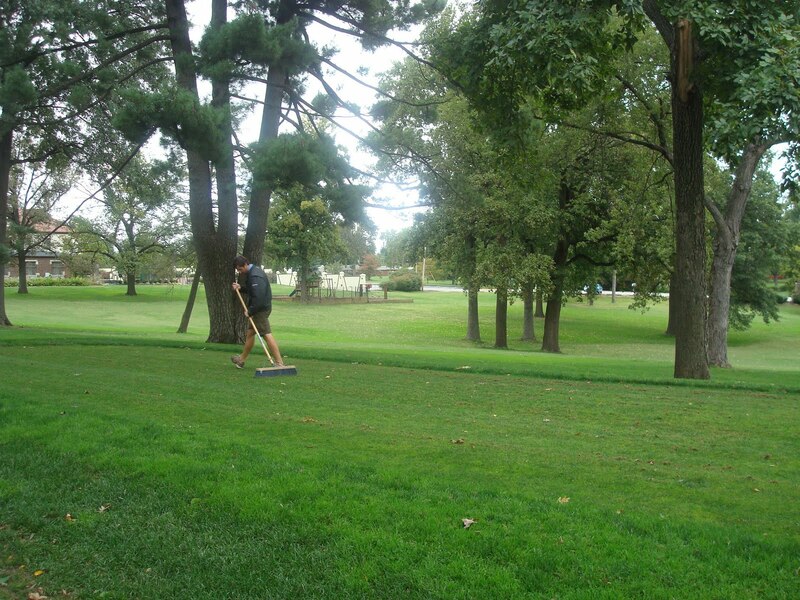 Each fall, we slit seed some additional ryegrass into the areas of tees that have the second mixture of grasses. 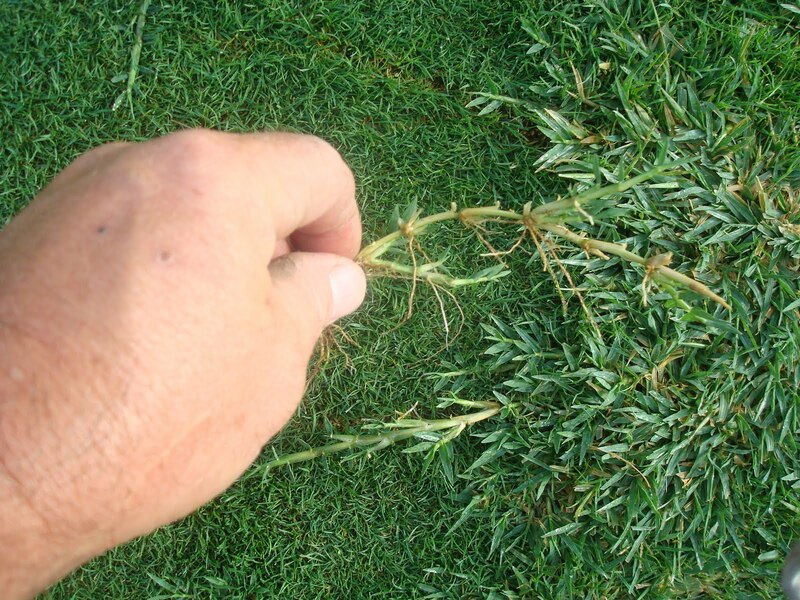 The ryegrass is very wear tolerant and can fill in a worn or damaged tee very quickly. We were fortunate to not lose very much tee surface this summer but still have some weak areas that needed to be seeded to help fill in for late fall and next season play. 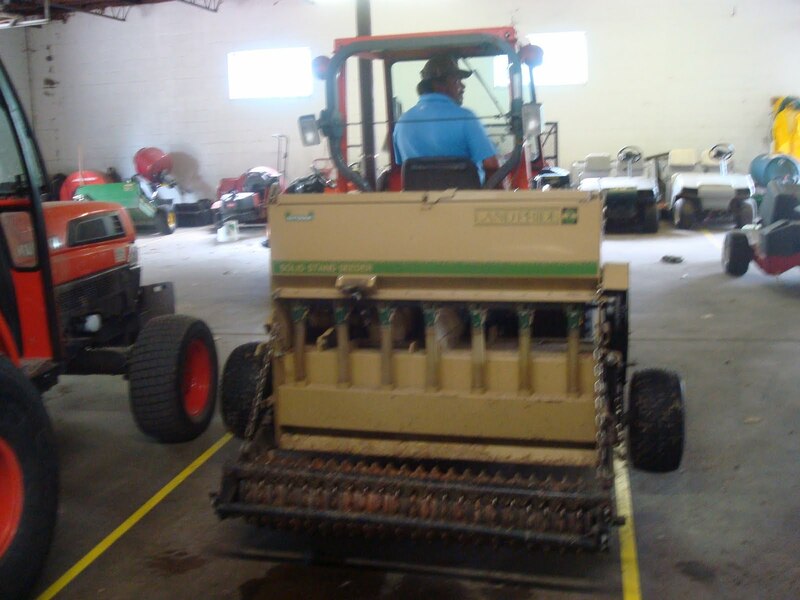 We used our walk behind slit seeder to spot drill the areas that needed repair. The areas were fertilized with a starter fertilizer to help the seed germinate and improve its root system as it begins to fill in the teeing ground area. 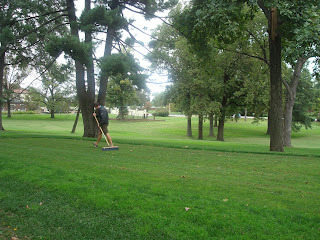 Assistant Mike brushing along the slits to place the seed in contact with the soil which will improve germination. 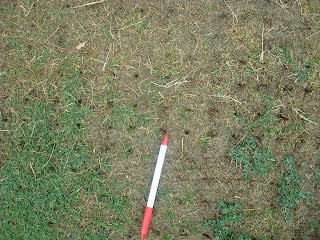 The slits in the tee surface where the seed will begin to germinate and fill in the worn areas of the tee. Congratulations to our mechanic Harry White and his new wife Tracey on their marriage in Las Vegas on August 21st. This past summer has been the best for warm season turf that I have seen in a few years. Both the zoysia and bermuda grass that we have are in great shape. 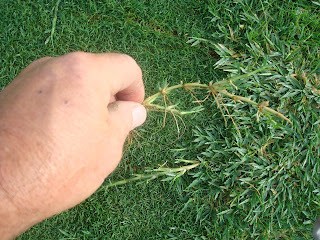 Bermuda grows much faster than zoysia and does create some difficulties when it sends out runners into collars and approaches. We have normally treated the collars a few times by this time of year but we had not made any applications until yesterday. The temptation for many is to pull the runner out of the green or collar which sometimes can be easy but other times will create an unsightly mess and leave voids in the turf. We will be making a couple of chemical treatments and will doing some verticutting with a seeder to regenerate new bentgrass into these areas and disrupt the growth of the bermuda. 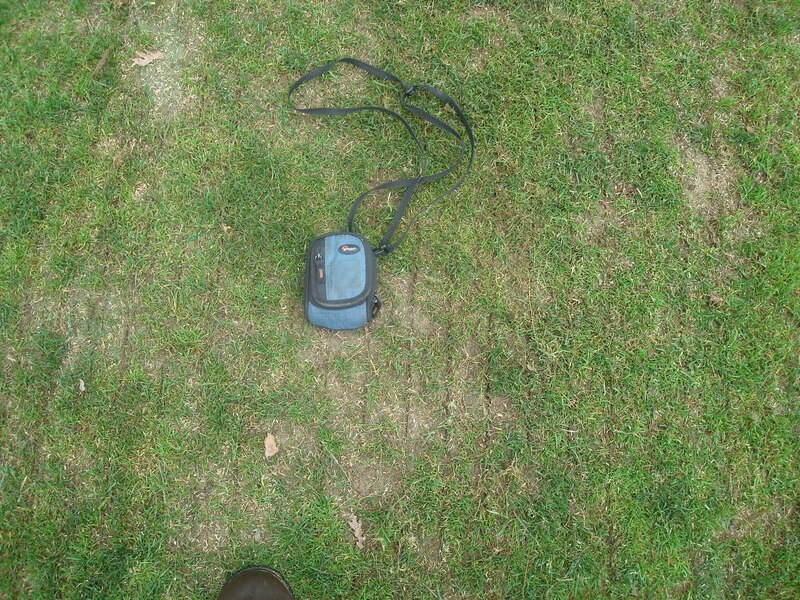 You will notice the bermuda grass beginning to lay on the existing ground without being tacked down except where it originated out of the ground. Be patient, and don't pull the runners. The mowers will cut them off. Below is a link to last years post which has more detail regarding this problem. 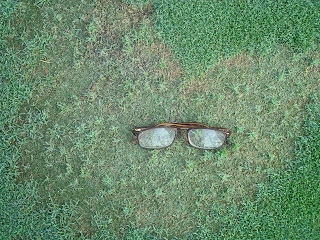 A collar on the practice green which has been over run with bermuda. This should improve over the next month as the chemical does its work and we seed into the area with new bentgrass. Bermuda runner I am holding with long white roots. The chemical will reduce the roots which do not allow it to tack down to the surface. Existing plant roots will be pruned away by the chemical leaving the plant vulnerable to moisture and nutrient deficiencies and winter kill. At the interface between the rough and zoysia intermediate at the beginning of our fairways, we have some thin and or bare areas that need attention. 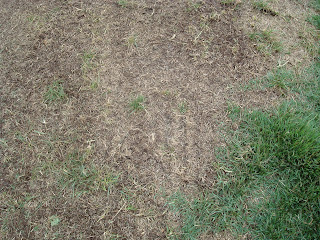 Some of the thinning has occured from our bermuda eradication program and some of the loss of turf is from wear and tear. We used our drill seeder over the past couple of days to get a head start on incorporating more turf type fescue into these areas. 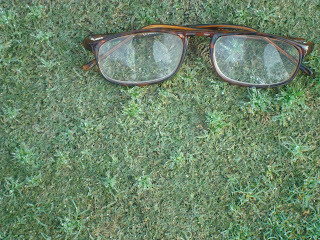 Our cool season surrounds have also taken a hit from disease, water managment, and bermuda encroachment. 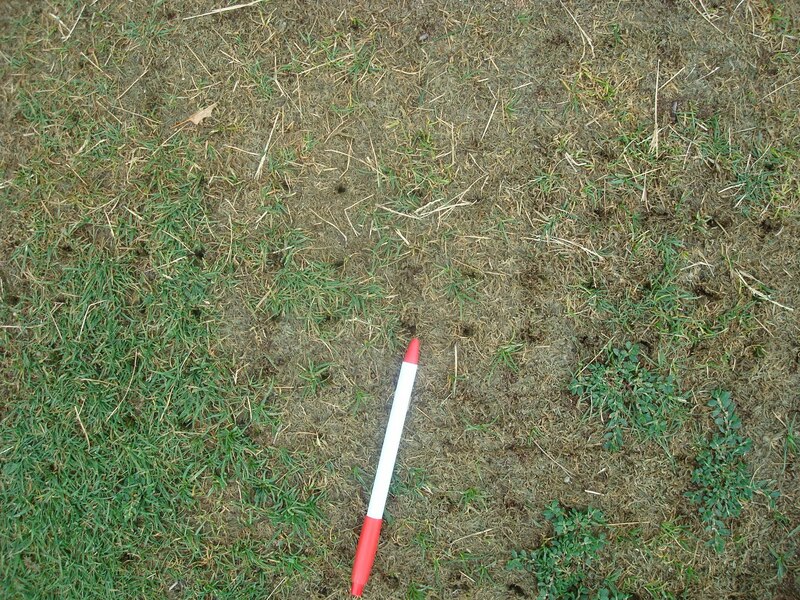 We also drilled some of these areas as well. We plan to do some Tupersan applications around the greens, collars and approach areas where the bermuda has moved back into these areas. The Turpersan prunes the roots on the bermuda and does not allow it to tack down to the ground which is one of its key components for survival and spreading. 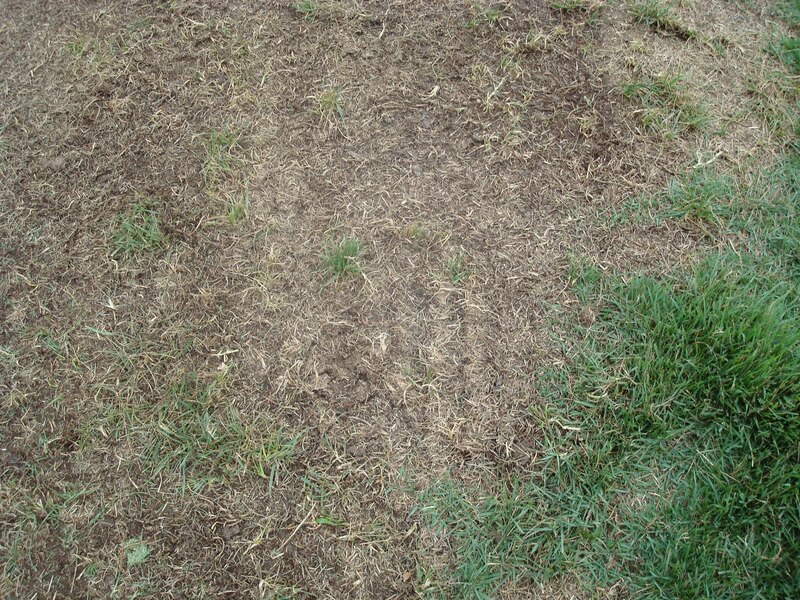 Bermuda that is unable to tack down is usually susceptible to winter kill. We will also be doing some bermuda eradication spray on these areas in October after the fescue seed has been germinated and matured. This will also set back the bermuda and allow the cool season grass to take over and thrive until next summer. We will follow up with additional sprays in the spring to reduce the competiveness of the bermuda before the summer heat sets in. No action shots of the drill seeder but here it is in the shop. The bottom of 13 rough/fairway. Some of this area was damaged from standing water where the turf was litterally cooked after heavy rain left the turf in standing water. The slits from the seeder are still slighly visible after the area is dragged with a mat to give the seed good contact with the soil. 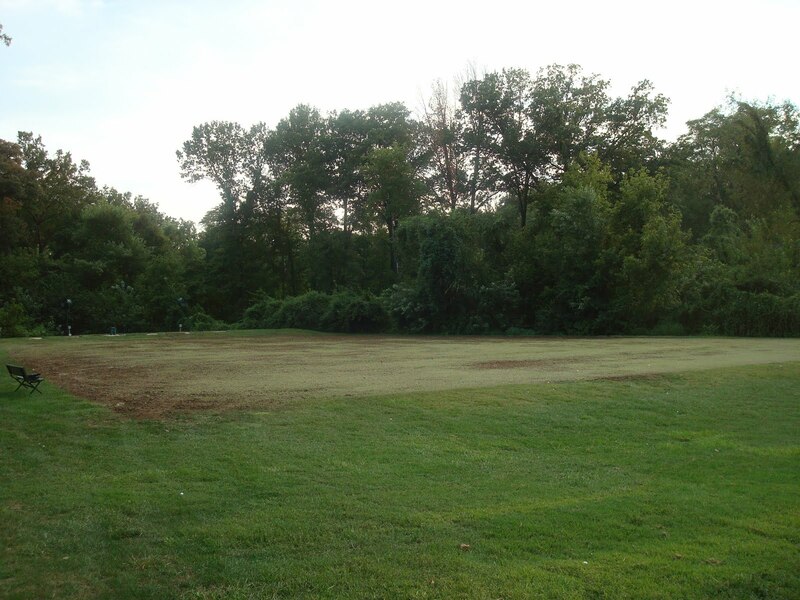 The area will be fertilized with a starter fertilizer to help the seed germinate and begin to grow. Germinated plants should be coming up over the next couple of weeks. 1980 average was 81.3 which is next in line for the hottest period over the last 5 decades. 57 days over 90 degrees during this period. The average is 37. Our nightly low average temperature was greater than the daily high temperature average during each month. 1/10 higher for June, 2 degrees higher in July and 1.5 degrees higher for August which put our turfgrass under tremendous pressure from both temperature and diseases. June was the 5th warmest on record, July the 21st and August the 15th. After going through this record year and now experiencing some near normal temperatures, I've had some time to put consider what was taking place to our turf over the last couple of months. No matter if it was a record year for temperatures or not, we never like to lose turf and believe we will be better equipped to handle this type of situation in the future. 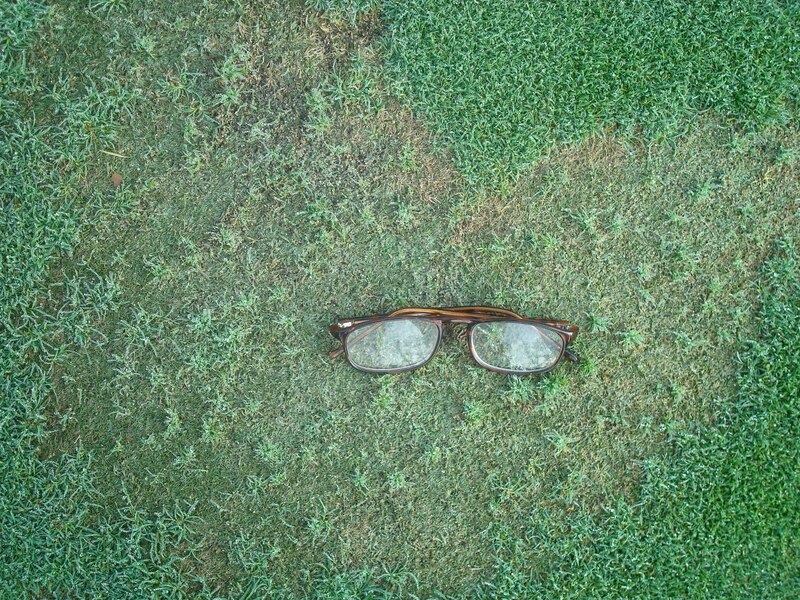 Why does Turf Die in the summer? 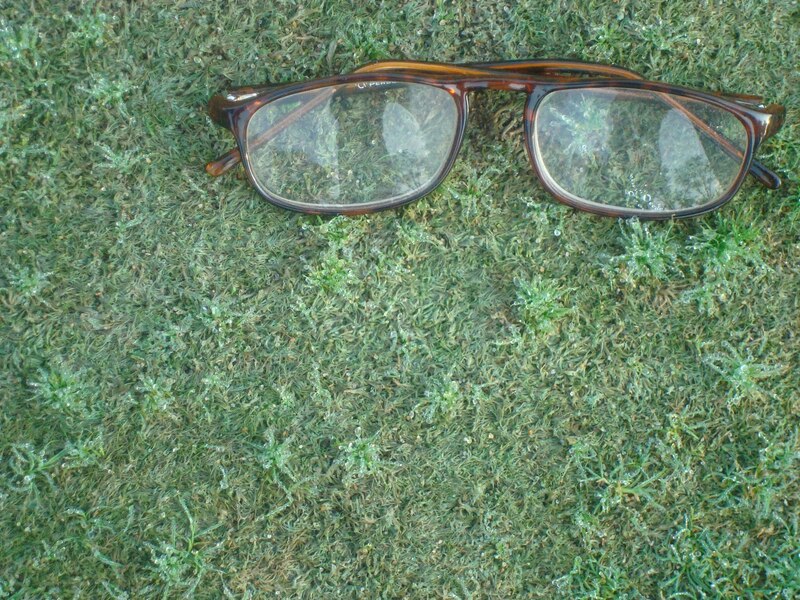 Pace Turf is based out of California and provides scientific research, news, information and expert advice for people in the turfgrass industry. They produced a video regarding the heat and humidity of 2010 across the country and tried to explain"Why does Turf Die In the Summer". 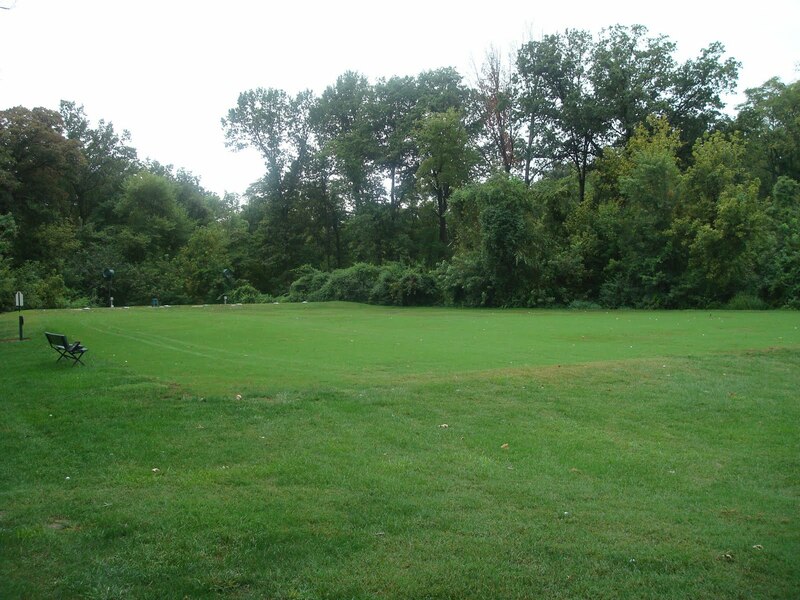 The range tee was renovated a couple of weeks agon. Below are a couple of pictures directly after seeding/renovation and this morning. I would expect the tee to be back in play before the Echofest in mid September. The range tee after revation 2 weeks ago. The range tee today. The ryegrass is filling in nicely. We put our old Toro Walk behind aerator back to work this week using our rescue tines to place some very small holes into our collars where we then seeded with bentgrass. For the most part, this is a very non-invasive operation which will allow us to get some new grass started in the next 7-10 days. The machine did a couple of laps around each collar. A drop seeder then placed some new seed around each collar and they were rolled and hand watered. 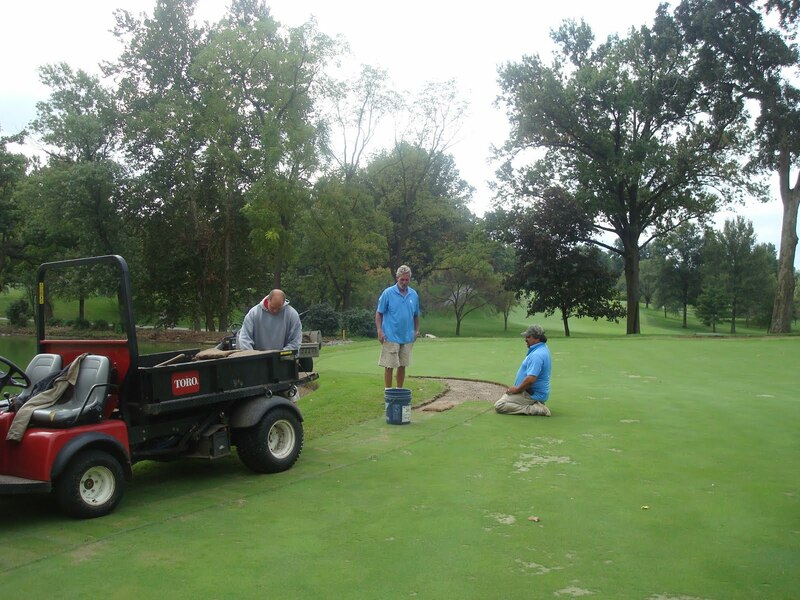 We did some hand work as well in the most severe spots to provide some additional openings in the soil surface so that more seed would germinate. Jason is walking the machine around the collar of #14. The tip of the pin illustrates the narrow spacing of the hole and the shallow depth of the tine. 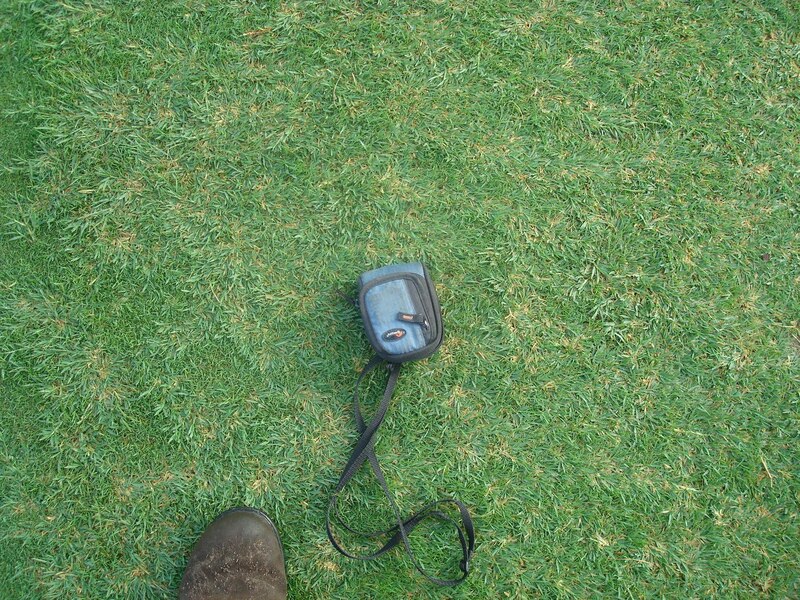 Bentgrass is very small and only needs very light contact with the soil to germinate. The bentgrass/poa collar on the front of #17 has been a problem for us since I've been here. 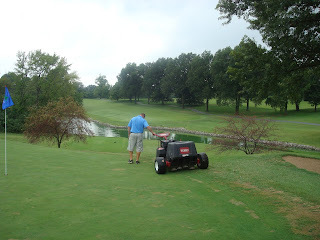 When we roll or have to use verticutters or we mow with the riding machine, there is no room for the equipment to turn. The same path has to be used, compaction occurs and the turf just gives out. In an effort to improve this section of green and surround, we tore out the old collar and placed zoysia grass in its place. The collar will be moved in by about 30" which should give us enough room for equipment to turn without damaging the turf too severely. Most of our equipment has a hydraulic system that powers the mowing decks or reels, lift the reels off of the ground for transport or back to the ground for mowing and the steering system. The hydraulic system operate at a pressure of 3000 psi. Every so often, a hose will become damaged and will leak or a moving piece on the mower creates a wear mark on the hose which weakens the wall and the extreme pressure literally blows a hole in the hose. Hopefully we catch a majority of our leaks before they occur but from time to time a hose will become damaged without our knowledge. A large amount of fluid can come out of a machine very quickly because of the high pressure. 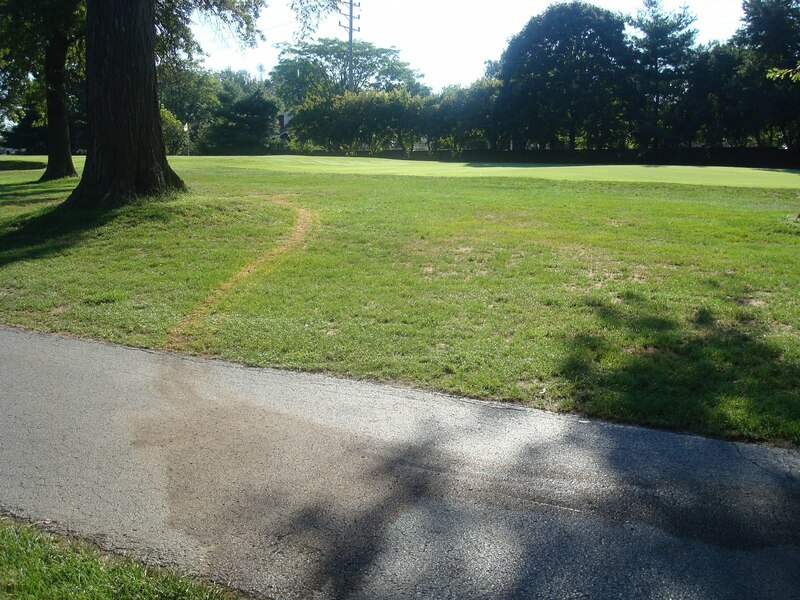 Late last week, a hose on the bunker rake gave way and left a trail of dead grass and a mess on the cart path near the 5th tee box. We attempt to get to the asphalt paths or driveways as quickly as possible to reduce the amount of turf that will have to be repaired and assist with an easier cleanup. 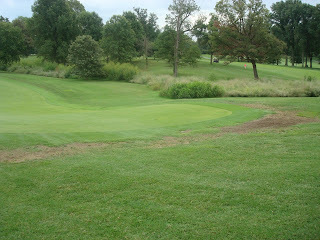 As our operator was coming out of the bunker on #4, he noticed a stream of oil shooting out underneath the front wheel. As you can see, the trail led back to the cart path where he was able to shut it off. As long as the soil was not saturated, we should be able to reseed in this area. 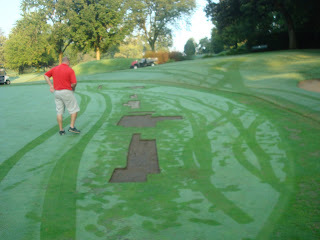 If too much oil is on the soil, a sod cutter will be used to strip up the spot and sod will be used to repair the spot. We utilize a company to manufacture hoses for us because the retail cost of hose replacement from the equipment dealer is not very cost competitive. 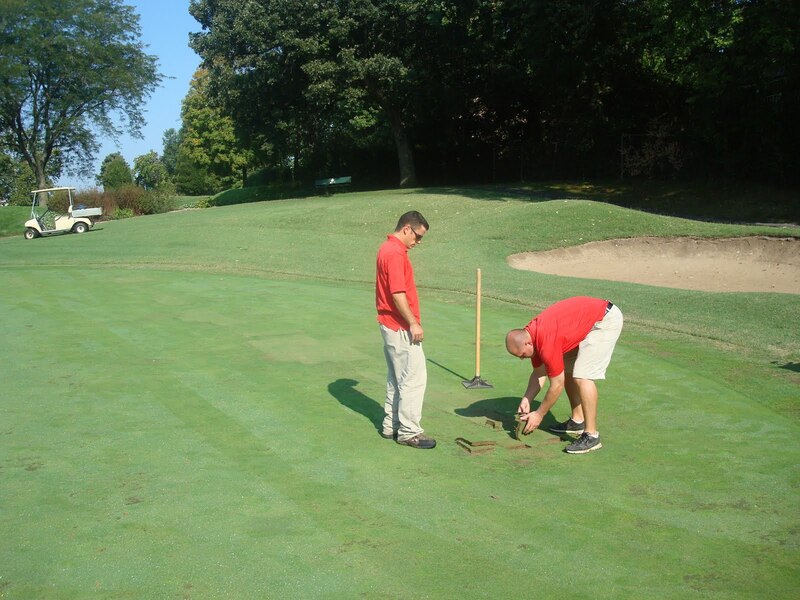 Over the years, many a superintendent has lost sleep with hydraulic leaks on greens and other fine turf areas. One advantage of using walking greens mowers is that their are no hydraulic system on the mower which could potentially leak oil onto a green.